The Yocto Project proudly presented the 2nd Yocto Project Developer Day on November 8, 2012, at the Hotel Fira Palace in Barcelona, Spain. This free event was co-located with the Linux Foundation's LinuxCon Europe and Embedded Linux Conference Europe. The event featured tracks for both new and advanced users with hands-on labs. Lunch was provided. Representatives from the Yocto Project Advisory Board discuss their organizations’ relationships with the Yocto Project and why they chose to join the project. Interactive Q&A panel discussion with Advisory Board members. involved in the Yocto Project, and information about the reference distribution build environment. Create your own custom embedded Linux® using an industry supported, open source infrastructure designed for embedded use—the Yocto Project (www.yoctoproject.org). Test your newly created Linux OS with the QEMU emulator and see how easy it is to rebuild it for your target hardware platform with a single configuration change. Learn a faster and more cost effective means to develop a custom embedded Linux image for your prototype or product. In this hands-on lab, students will learn how the Yocto Project build system is organized, how to write Bitbake recipes, and customize their Linux OS images. The material is based on real-world problems that embedded developers face in the industry today. Hands-on exercises showing how to modify and configure the Linux kernel using the Yocto Project Linux kernel tooling. yocto-bsp. Demonstrates end-to-end efficient image customization and BSP layer creation. In-the-trenches perspective on how the Yocto Project can be leveraged to bring your distribution up to speed in terms of customization and scale. A discussion about how the linux-yocto repositories are constructed and maintained, with particular emphasis on configuration fragment management and how to track linux-yocto for custom BSPs. According to a recent survey, more than 90% of products based on open source operating systems are out of compliance with their respective licenses, either from the complexity of complying or from a lack of knowledge about what is needed. The Yocto Project makes license compliance so easy that there is no reason not to comply. This talk explains how. The objective of this session is to engage the Yocto Project developers in an interactive discussion about the Yocto Project and tool usability, specifically focusing on the end-user experience. Several real-world customer scenarios will be presented with the hope of developing a constructive community conversation around these scenarios and potential (or existing) solutions to these scenarios. 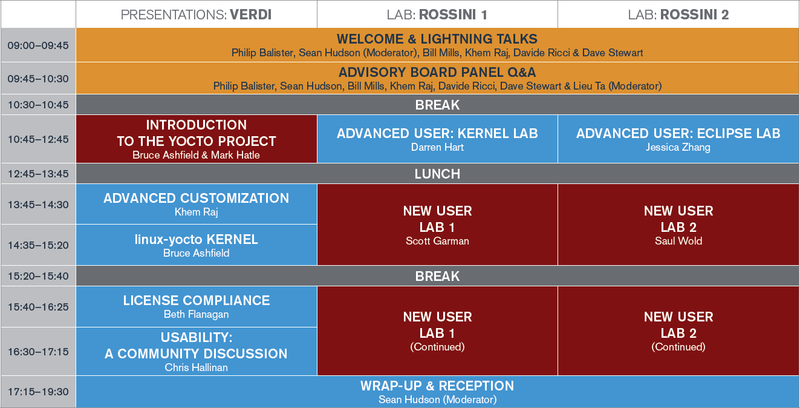 Join the entire Yocto Project team for feedback and refreshments. Beer, wine, and hors d’oeuvres provided. 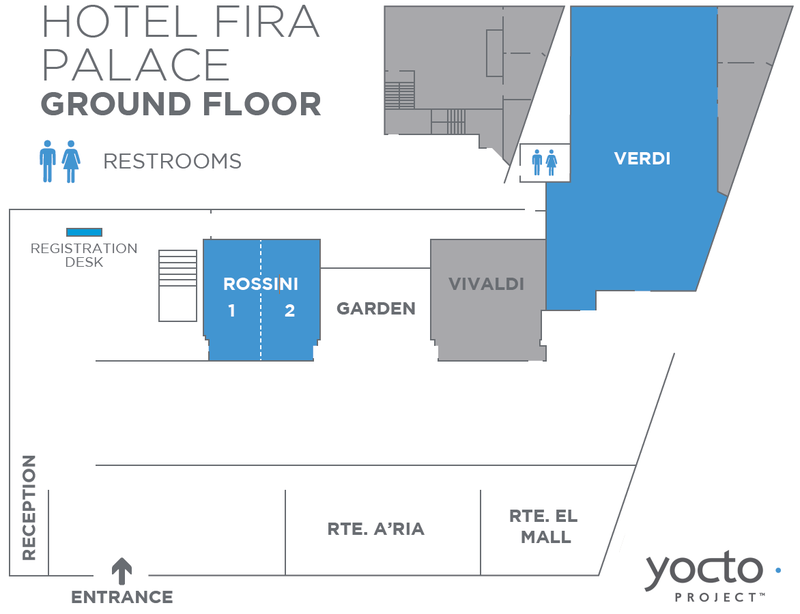 Dev Day takes place at the Hotel Fira Palace in Barcelona, Spain, on November 8, 2012. Plenary sessions are held in the Verdi room. Labs are held in Rossini 1 and 2.